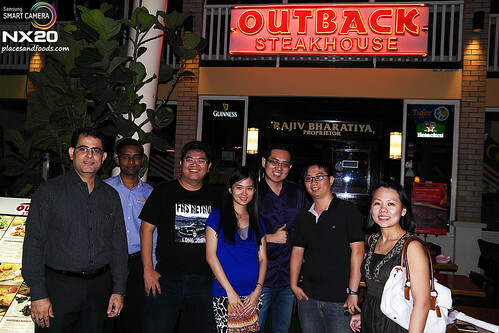 When you mentioned Outback, you know it is referred to the wilderness of Australia. 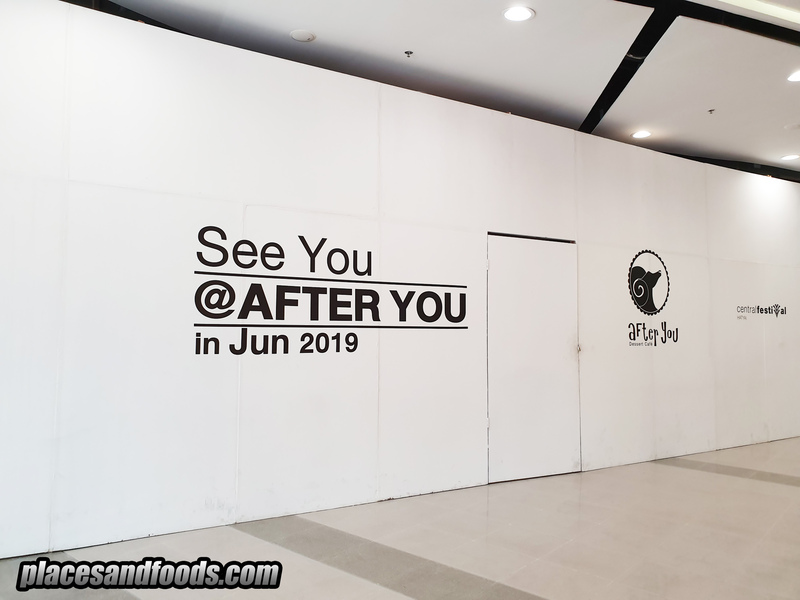 However, when you mentioned Outback SteakHouse, you know it is the restaurant located in BB Park near Low Yat Plaza and Bukit Bintang Plaza. 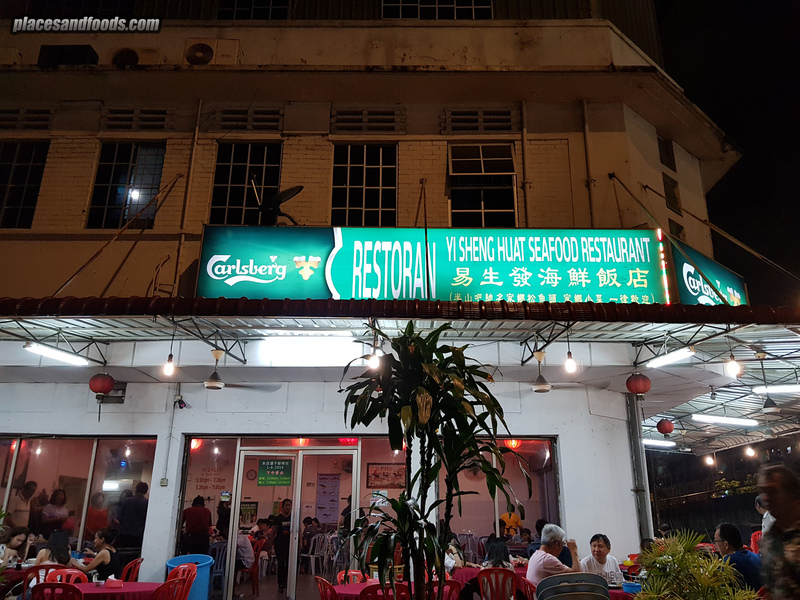 The restaurant has been there for more than a decade and last Saturday it was our first time being there for the food review. Outback Steakhouse proudly traces its beginnings to the entrepreneurial spirit of a group of restaurateurs in Tampa. Inspired by the hit movie Crocodile Dundee, Outback Steakhouse was conceptualized as an American outlet with an Australian theme. Within a mere twenty years, the upstart steakhouse on Henderson street, Tampa has grown into a nearly 1200 -restaurant strong international chain spanning 23 countries in America, Europe, Asia, Australia and the Middle East. 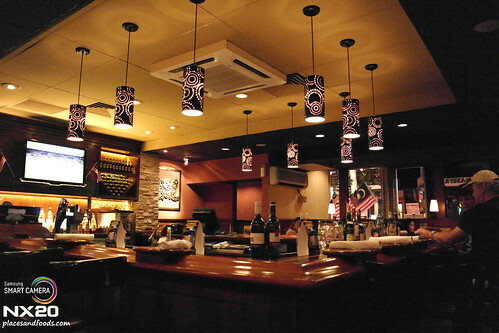 Interior of Outback SteakHouse. ISO 6400, f/3.5- 1/50 with Samsung NX-20. 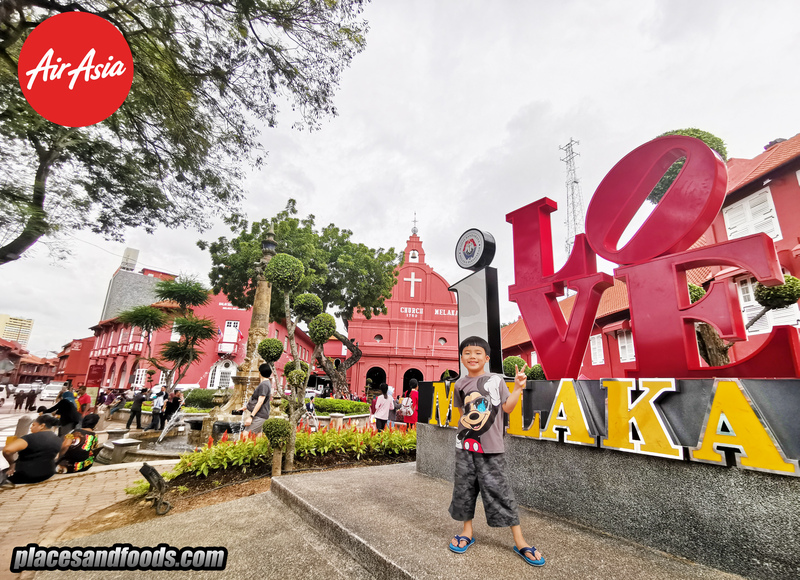 Located in the tourist hot spot, we had no trouble locating the restaurant. 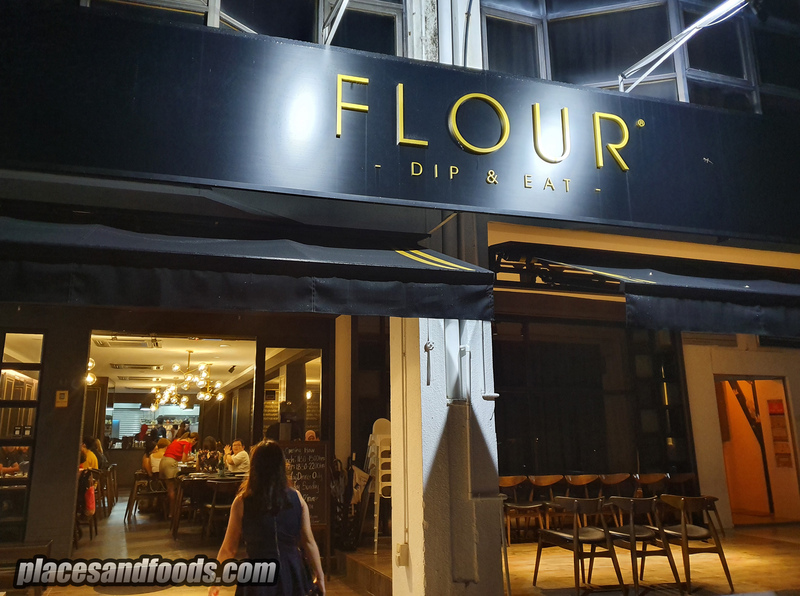 The restaurant offers a typical “American style” comfortable ambience, great for dining and drinks. Oreo Milkshake! ISO 6400, f/4.5- 1/50 with Samsung NX-20. It wasn’t long until we ordered our drinks. We ordered the Oreo Milkshake and Mango drink. 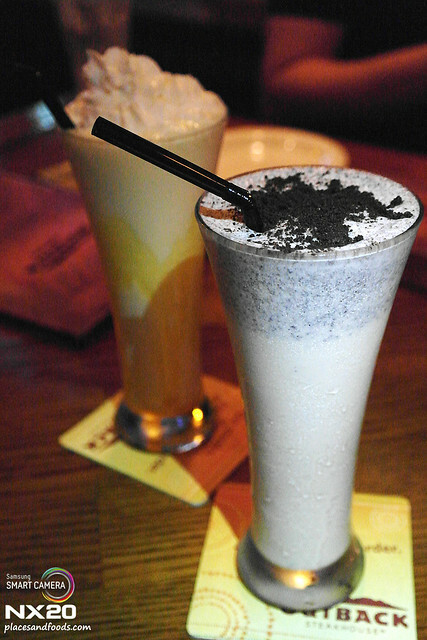 Both were equally delicious, the Oreo milkshake was creamy while the Mango drink was refreshing. ISO 6400, f/3.5- 1/50 with Samsung NX-20. We started off with the Crispy Chicken Caesar Salad. Strips of deep fried battered chicken strips with the Caesar salad. 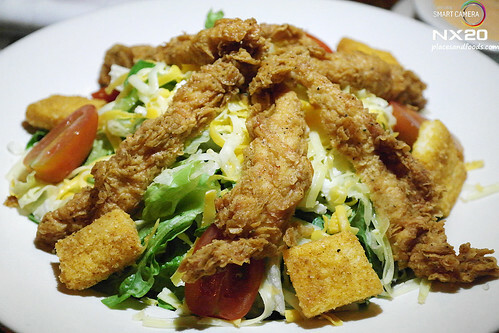 Fried chicken strips served over mixed lettuce with tomatoes, cheese, beef bacon, diced egg, croutons and homemade dressings, we have no complains. 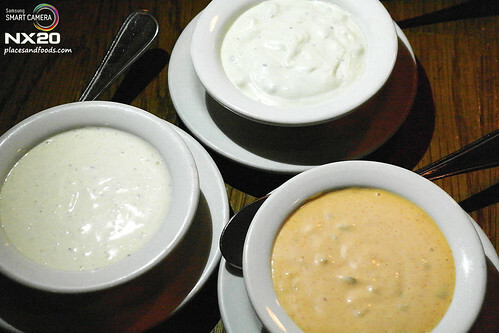 The three dressings, Ranch, Thousand Island and Blue Cheese. ISO 6400, f/7.1 – 1/50 with Samsung NX-20. Outback Steakhouse cooks their own dressings with their secret recipe as we were told. There were the Ranch dressing, Thousand Island dressing and Blue Cheese dressing. Ranch dressing is creamier while surprisingly Thousand Island dressing has hints of spicy while blue cheese dressing has only hints of the blue cheese dressing. I prefer the Blue Cheese dressing while Rachel enjoyed the Ranch dressing. 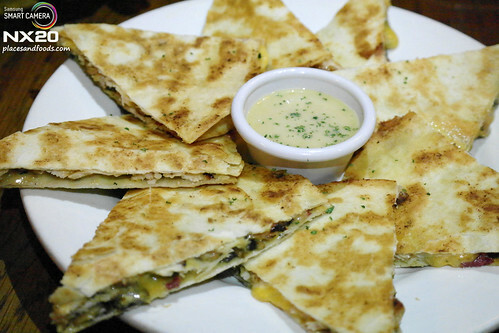 Alice Springs Chicken Quesadilla. ISO 6400, f/4.5- 1/60 with Samsung NX-20. Next was the Alice Springs Chicken Quesadilla. A grilled flour tortilla stuffed with grilled chicken breast, sautéed mushrooms, beef bacon, melted cheeses and served with honey mustard sauce. This one of the best quesadillas we had for a very long time. As they make their own tortilla, it is fresher and tastier than the supermarket’s packed ones. Remember to dip it with the honey mustard sauce, you won’t regret it. 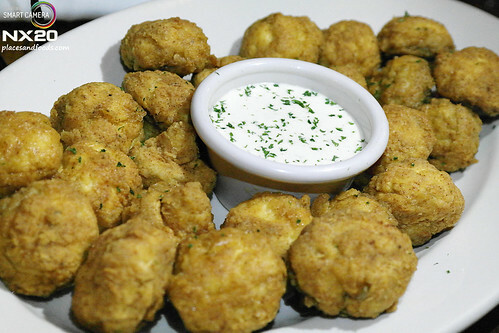 Crispy Fried Button Mushrooms. ISO 6400, f/7.1- 1/50 with Samsung NX-20. Crispy Fried Button Mushrooms was really something else. Crispy and crunchy on the outside, soft and hot on the inside, this was addictive! Seafood Pasta. ISO 3200, f/5.6- 1/60 with Samsung NX-20. 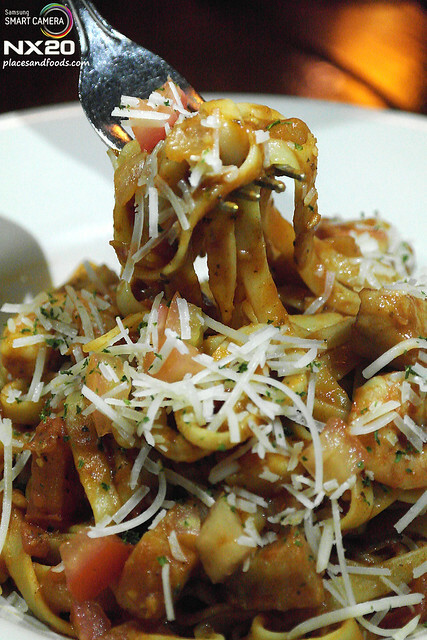 Seafood Pasta was a combination of shrimp, calamari and fish fillet with fettuccine tossed in their homemade marinara sauce and Parmesan cheese. Delectable! 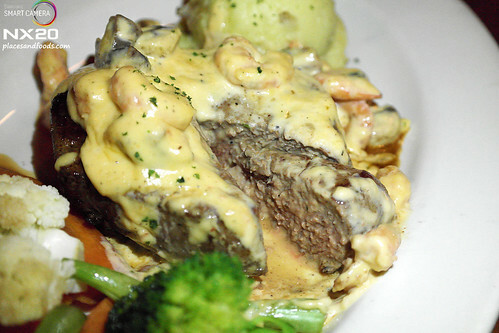 The Victoria’s Fillet . ISO 3200, f/5 – 1/60 with Samsung NX-20. 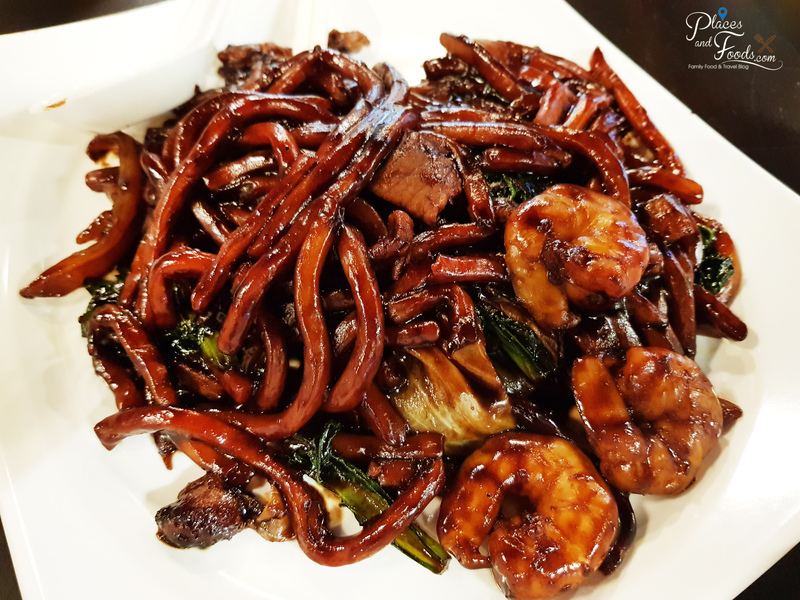 Move on to the Signature dishes! The Victoria’s Fillet cooked in medium rare. 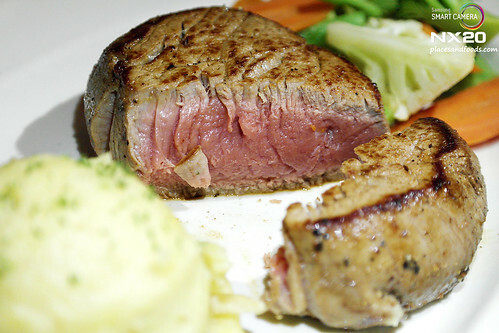 The most tender and juicy 8 oz thick cut fillet. 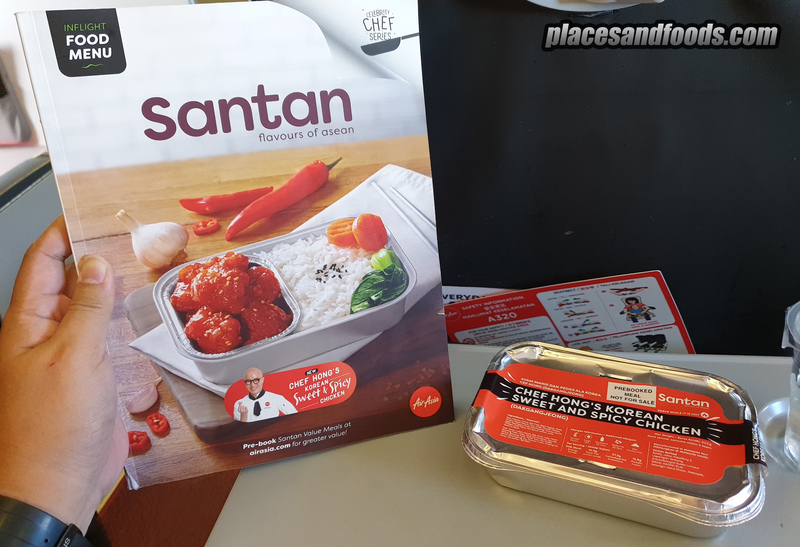 We loved it without any dressings and sauces for the natural taste of the beef. Toowoomba Topped Fillet . ISO 3200, f/5.6 – 1/60 with Samsung NX-20. It won’t be spectacular without the Toowoomba Topped Fillet cooked in medium well. Sauteed shrimp and button mushrooms tossed in a tomato cream sauce and served over a seasoned and seared fillet and served with fresh seasonal veggies. Toowoomba Topped Fillet . ISO 3200, f/5.6- 1/60 with Samsung NX-20. 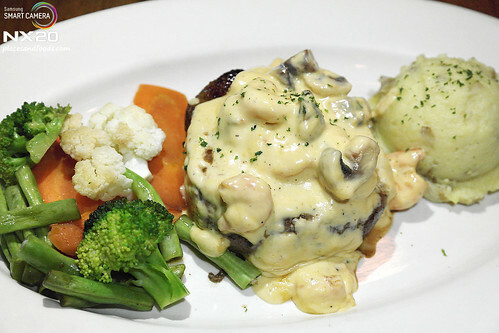 One of the top sellers of the restaurant and this was similar with the earlier fillet by topped with creamy sauce. Did we mention that their beef are grain-fed beef imported from Australia? Chocolate Thunder from Down Under. ISO 3200, f/5.6 – 1/60 with Samsung NX-20. 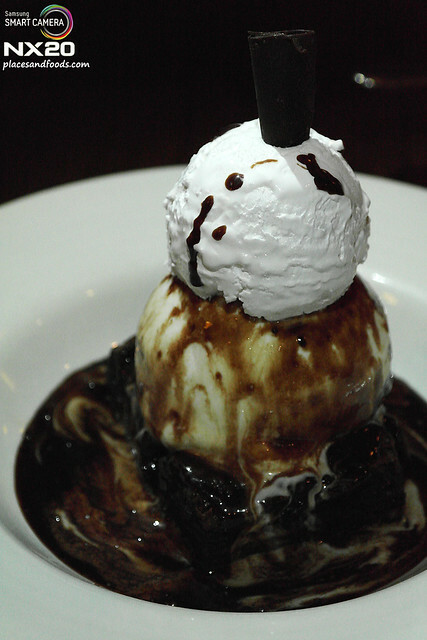 Lastly, we completed our food review with Chocolate Thunder from Down Under. As frightening the name sounds, Chocolate Thunder From Down Under is actually fresh baked pecan pie brownie crowned with rich vanilla ice cream, dizzled with warm chocolate sauce and finished with chocolate shavings and whipped cream. Not just sweet but this was glorious. The portion was generous easily enough for two persons and above. 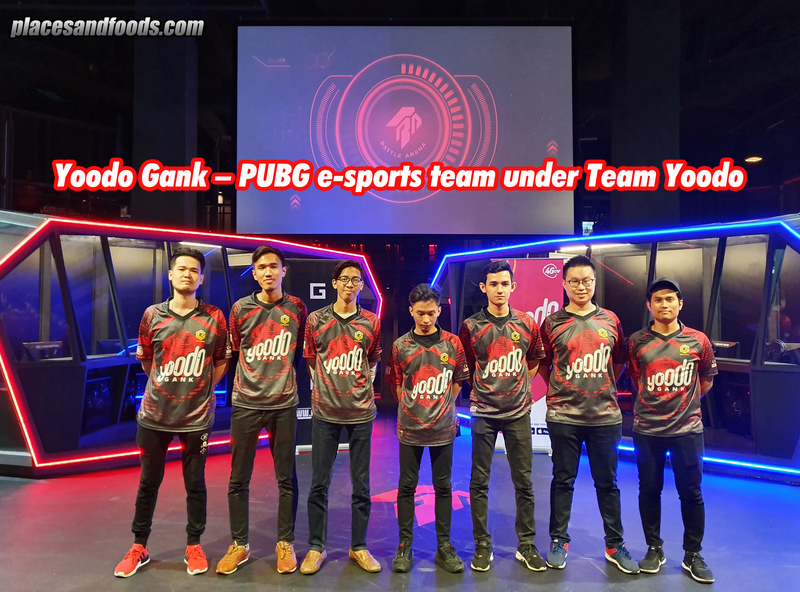 As one of the fastest growing chain of restaurants in the world, Outback Steakhouse offers fresh homemade food and popular with its generous portions. 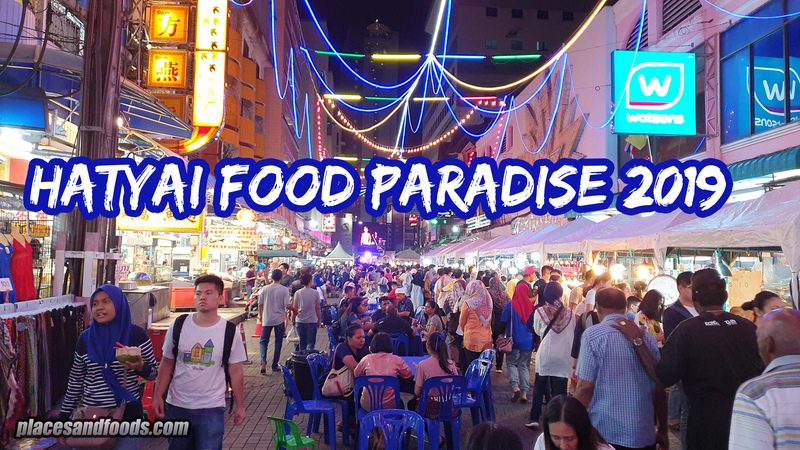 Located in the busy streets of Jalan Bukit Bintang next to Low Yat Plaza and Bukit Bintang Plaza, the restaurant is popular with both locals and tourists. Like we said, they are generous with the portion so don’t over order your food!